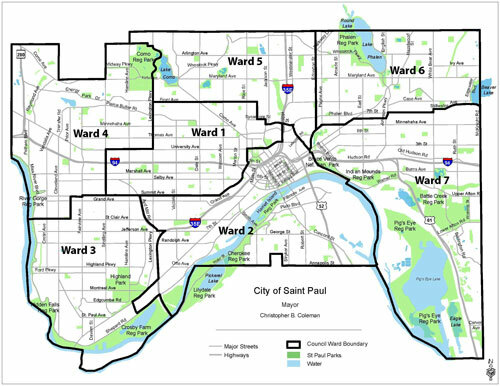 This map shows the ward boundaries in the city of St. Paul. The St. Paul DFL will hold precinct caucuses on Tuesday, Feb. 3, and choose delegates to the ward conventions, some of which will be held the same evening at the same location immediately following the precinct caucus. Delegates to the city convention on Sunday, April 19, will be selected at each ward convention. The St. Paul Republican City Committee has not announced a caucus or convention schedule. No caucuses are scheduled in the cities of Lauderdale or Falcon Heights. Four seats on the St. Paul Public Schools Board of Education and all seven St. Paul City Council seats will be up for election on Nov. 3. The first day to file an affidavit of candidacy for these seats isn’t until July 28, but a number of candidates have announced their intention to run. Ward 4 city councilmember Russ Stark is seeking re-election and is the only announced candidate for that ward at this time. Councilmember Amy Brendmoen has announced her candidacy for Ward 5, along with challengers David Glass and David Sullivan-Nightengale. The seats of school board members Mary Doran, Keith Hardy, Anne Carroll and Louise Seeba are up for election. Seeba announced in January that she would not seek re- election. Eight St. Paul residents have announced their intentions to run in the school board election. They include: St. Anthony Park Community Foundation executive director Jon Schumacher, the father of two daughters who graduated from St. Paul Public Schools; Steve Marchese, a lawyer who runs the state bar association’s pro bono program and the father of a sixth-grader at Capitol Hill magnet school; Zuki Williams Ellis, the mother of a first-grader at J.J. Hill Montessori who chairs the parent-teacher organization there and trains parents for the Parent/Teacher Home Visit Project in St. Paul; Mary Vanderwert, who worked as the Head Start collaboration director for the Minnesota Department of Education from 2005 to 2014; former school board member Al Oertwig; Robert McClain, a 46-year St. Paul resident who had two daughters graduate from Central High School, has a granddaughter attending Gautier Elementary and has served as a community resource volunteer at Maxfield and Bruce Vento elementary schools and as a board member with the St. Paul Children’s Collaborative, Neighborhood Justice Center and St. Paul Police Civilian Review Board; Rafael Espinosa, a father of four children in St. Paul Public Schools who has been active in his kids’ schools and his community; and Jessica Banks, whose biographical information was not available at press time. Ward 4, which covers St. Anthony Park and the eastern part of the Como Park neighborhood (see map on page 1), will caucus at Hamline Elementary School, 1599 Englewood Ave. The ward convention will immediately follow the caucus that night at the school. Ward 5, which covers the western half of Como Park, will caucus at Washington Technology Magnet, 1495 Rice St. The Ward 5 convention will be held Saturday, Feb. 21, at Como Park Senior High School, 740 Rose Ave. W.
Sign in at each caucus is at 6:30 p.m. The caucuses start at 7 p.m. Delegates elected at each precinct caucus will endorse a city council candidate and school board candidates at their ward conventions. Precinct caucuses and ward or city conventions are open to the public, but to vote, offer resolutions or become a delegate you must be eligible to vote by the November election, live in the precinct or ward and agree with the principals of the political party.